Vinyl vs fiber cement siding – comparison chart. Which siding material is better? Vinyl siding is available in enormous variety of colors, textures, and styles. Fiber cement siding is normally made as horizontal panels or shingles in light grey or brown colors. Other color options available as well. Good for finishing exterior of any outdoor structures. Great exterior material for finishing vertical walls of residential houses. Depends on installation quality. Fairly resistant to wind. With correct installation has high ability to withstand strong wind. From fair to poor impact resistance. Good resistance to impacts and able to withstand hail storms much better compare to vinyl siding. Very susceptible to open fire or high temperature. Most products have highest fire resistance rating. It is non-combustible material. Impervious to insects or termites. Vinyl siding do not rot. Durable material, but can be damaged by heavy abuse. Non-insulated vinyl siding do not have any insulation ability. Rigid foam insulation with R value from 2 to 3.9 which is laminated of freely attached to the back of siding panels helps to keep heat inside the house during winter time and not letting the hot air penetrate walls easily during summer time. Much higher compare to non-insulated vinyl siding. Normally shortest life expectancy compare to other siding options. Often should be replaced in 20 – 30 years. Over 50 years with proper maintenance. Should be painted periodically to ensure long lasting performance. Significantly vary. Typically from 25 to 30 years limited warranty. In boxes 121 – 151 inches (3.1 – 3.8 meters) long. Boxes different dimensions. Typical length for lap siding vary from 96” to 144. Fiber cement shingles dimensions normally 12” x 24”, 14” x 26”, 18” x 48”. Depends on thickness, but vinyl is one of the most lightweight siding material. Much heavier compare to vinyl siding. Normally weight 2.1 – 2.5 lbs/ft2. One of the cheapest siding materials. Prices of fiber siding greatly vary, but it is more expensive product compare to vinyl siding. Charges to install one square of vinyl siding are lowest compare with any other siding options. Labor fees for fiber cement siding installation could be 50% – 90% higher in comparison with vinyl siding. Installation of vinyl siding panels is one of the easiest tasks, but correct installation technique is an essential factor which directly impact siding performance and longevity. From easy to moderate difficulty exterior renovation project. Installation of 23 - 27 squares of vinyl siding on two story house with simple walls normally should be completed by a crew of 3 in couple days excluding any preparation or additional work. Replacement of vinyl siding on the same size house typically takes three to four days not counting installation of new soffit, fascia, gutters, downspouts or window trims. Crew of 4 normally is able to install 25 - 30 squares of fiber cement lap siding boards in 4 to 5 days. Replacement might take 5 to 7 days. Single vinyl panel is easy to remove and replace with a new one without damaging other panels. Depends on damage, typically moderate difficulty task. Vinyl siding expands and shrinks with changing outdoor temperature. If siding installed very tight, it can start bucking. Too loose installed siding might be blown off by strong wind. 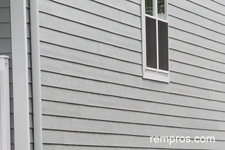 Discoloring normally is a result of poor care or low quality of siding itself. With low coefficient of expansion, fiber cement siding does not shrink or expand much. 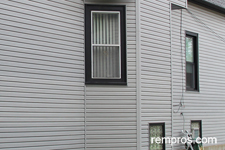 Most problems with fiber cement siding is a result of improper installation or poor maintenance. 1 Rating was estimated on the scale from 1 to 5, accounting 1 as lowest and 5 as the highest quality of a product. Always consider the fact: not all products made equally the same and performance of particular siding significantly depends on individual product quality, adequate installation, and proper maintenance. Vinyl and fiber cement siding have their own advantages and disadvantages. There is no straight answer which siding is better because it depends on many factors. With adequate installation and proper maintenance, quality fiber cement siding have longer lifespan and better resistance to severe weather conditions compare to budget friendly vinyl siding which still tends to be much more popular material because of lower initial cost.